The North American mink (Mustela vison) is a member of the Mustelidae or weasel family whose natural range covers most of the USA and Canada. It is not a native species to the British Isles and yet the creature is now endemic in our countryside. Why? Firstly the reason they are here at all is because they were imported and bred in their thousands for exploitation by our fur trade. The species was first brought to Britain in 1929 and to the Republic of Ireland in 1951. If these fur farmers had expected their released mink to merely die they were singularly ignorant. The habitat the mink found was much the same as in their native North America and they thrived. 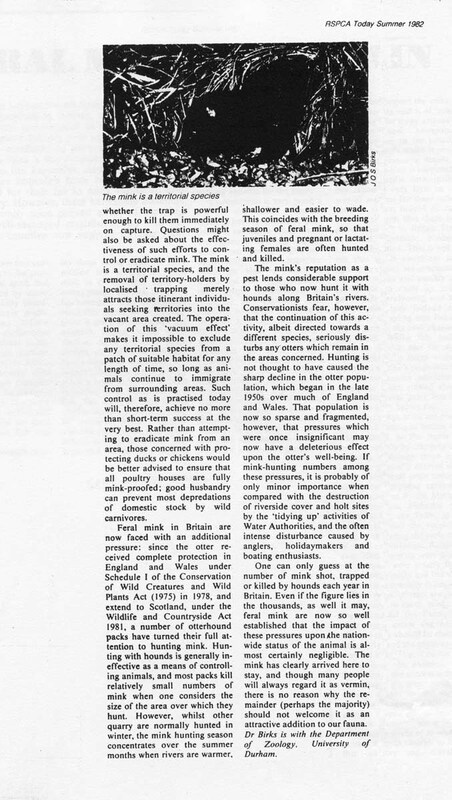 Once the mink were put in our countryside by the fur trade it was the activities of other animal abusers – the hunters – that spread the species the length and breadth of Britain. For a few hunters the summer pursuit of this semi-aquatic mammal is a near obsession. 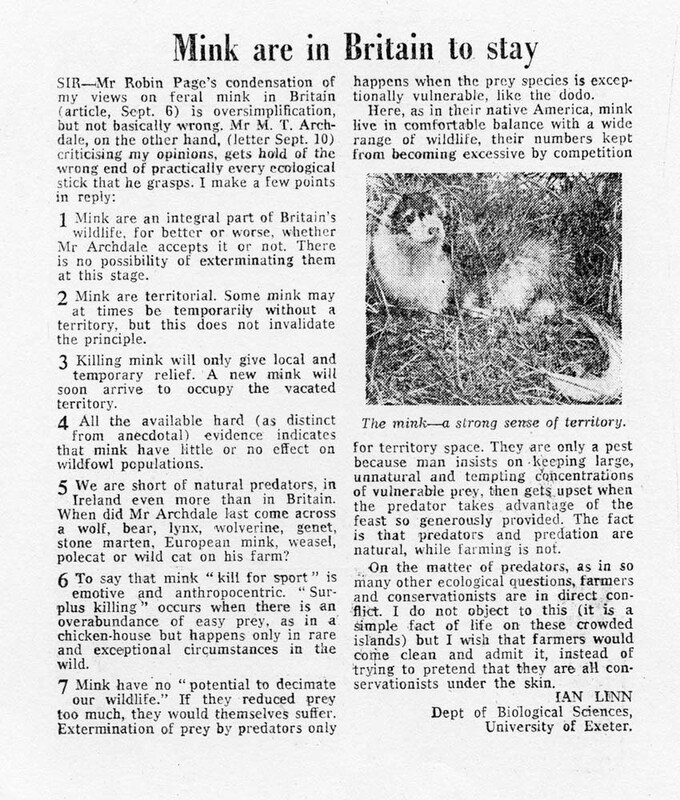 For them in the early 1970s the arrival of mink in numbers was very timely as they were fast running out of their normal summer hunting quarry – the otter. Their hounds quickly took to hunting mink as well as otters. They killed some mink but they drove other mink up and down our rivers far from where they found them. The North American mink is much smaller that the European otter (Lutra lutra). Male mink can weigh up to 1.5kg with the females about half that size (0.5 to 0.8kg). By comparison otters vary in weight from 5.5 to 16kg. Mink breed once annually, with mating occurring from February to April. Before the Hunting Act 2004 the UK mink hunting season ran from March to September. The former mink hunts still try to hunt our rivers during this same time period but now claim to be hunting rats, or trail lines or they claim to be just exercising their hounds. Mink have a widely varied diet according to the food available. It includes large insects, frogs, rabbits, rats, fish and birds. 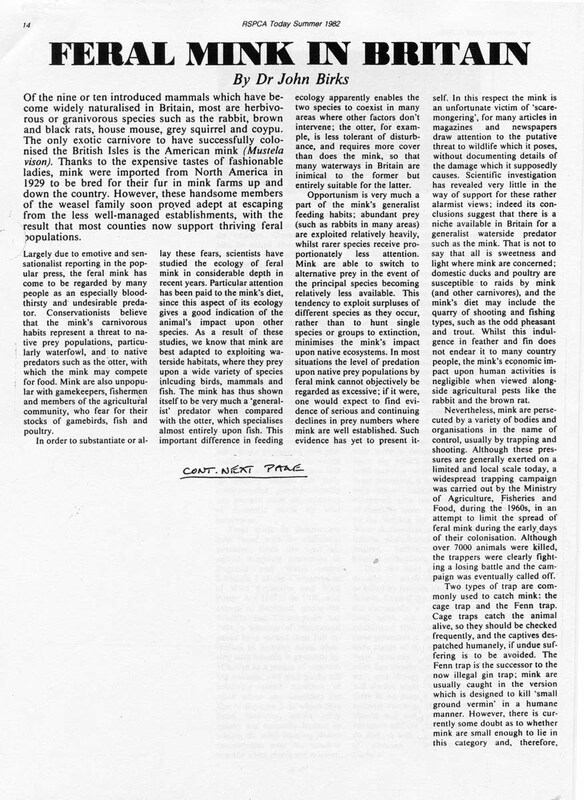 Hunting and shooting enthusiasts and their friends in the media are keen to exaggerate the threat posed by mink to our native wildlife but responsible scientists take a more considered view.